The carotid artery brings needed blood to your brain and face. You have one of these arteries on each side of your neck. Blood flow in this artery can become partly or totally blocked by fatty material called plaque. 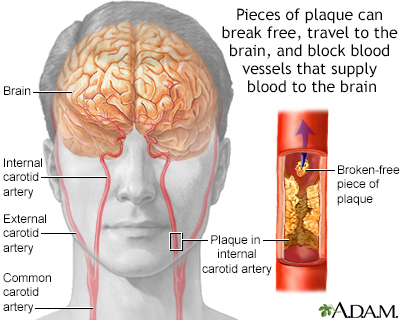 This can reduce the blood supply to your brain and cause a stroke. There are two procedures to treat a carotid artery that has plaque buildup in it. This article focuses on a surgery called endarterectomy. The other method is called angioplasty with stent placement. You receive general anesthesia. You are asleep and pain free. Some hospitals use local anesthesia instead. Only the part of your body being worked on is numbed with medicine so that you do not feel pain. You are also given a medicine to help you relax. You lie on your back on an operating table with your head turned to one side. The side your blocked carotid artery is on faces up. The surgeon makes a cut (incision) on your neck over your carotid artery. A flexible tube (catheter) is put in the artery. Blood flows through the catheter around the blocked area during surgery. Your carotid artery is opened. The surgeon removes the plaque inside the artery. After the plaque is removed, the artery is closed with stitches. Blood now flows through the artery to your brain. Your heart activity will be monitored closely during surgery. The surgery takes about 2 hours. After the procedure, your doctor may do a test to confirm that the artery has been opened. This procedure is done if your doctor has found narrowing or a blockage in your carotid artery. Your doctor will have done one or more tests to see how much the carotid artery is blocked. Surgery to remove the buildup in your carotid artery may be done if the artery is narrowed by more than 70%. If you have had a stroke or temporary brain injury, your doctor will consider whether treating your blocked artery with surgery is safe for you. No treatment, other than tests to check your carotid artery every year. 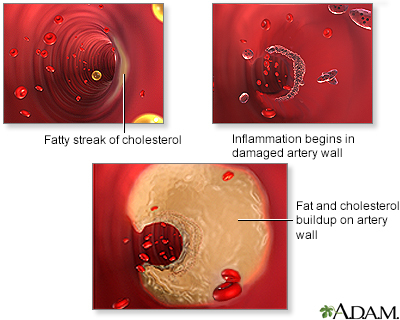 Medicine and diet to lower your cholesterol. Blood-thinning medicines to lower your risk for stroke. Some of these medicines are aspirin, clopidogrel (Plavix), dabigatran (Pradaxa), and warfarin (Coumadin). Carotid angioplasty and stenting is likely to be used when carotid endarterectomy would not be safe. Your health care provider will do a thorough physical exam and order several medical tests. Tell your provider what medicines you are taking, even medicines, supplements, or herbs you bought without a prescription. A few days before the surgery, you may need to stop taking blood-thinning drugs. These include aspirin, ibuprofen (Advil, Motrin), clopidogrel (Plavix), naprosyn (Aleve, Naproxen), and other drugs like these. Follow instructions on when to stop eating and drinking before surgery. Take any medicines your doctor prescribed with a small sip of water. Follow instructions on how to take care of yourself at home. Carotid artery surgery may help lower your chance of having a stroke. But you will need to make lifestyle changes to help prevent plaque buildup, blood clots, and other problems in your carotid arteries over time. You may need to change your diet and start an exercise program, if your doctor tells you exercise is safe for you. It is also important to stop smoking. Arnold M, Perler BA. Carotid endarterectomy. In: Sidawy AN, Perler BA, eds. Rutherford's Vascular Surgery and Endovascular Therapy. 9th ed. Philadelphia, PA: Elsevier; 2019:chap 91. Biller J, Ruland S, Schneck MJ. Ischemic cerebrovascular disease. In Daroff RB, Jankovic J, Mazziotta JC, Pomeroy SL, eds. Bradley's Neurology in Clinical Practice. 7th ed. Philadelphia, PA: Elsevier; 2016:chap 65. Perler BA. Carotid endarterectomy. In: Cameron JL, Cameron AM, eds. Current Surgical Therapy. 12th ed. Philadelphia, PA: Elsevier; 2017:937-941.